Winter definitely calls for something fiery something spicy. Which will shake away the winter laziness and remind us of our very existence. If that is something you believe in then this chili pickle is for you. 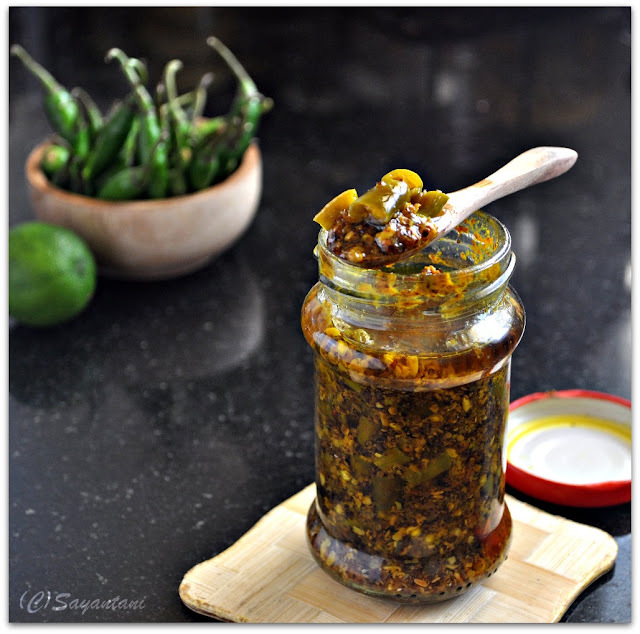 A hot, spicy, tangy almost instant chili pickle which pairs really well with out of the wok stuffed parathas and khichris. Am not quite aware of the varieties of chillies available around and not very fond of them either. All I like is the beautiful flavour of the green chilies and the round taste that it provides when added to curries. Never ever dared to touch that fiery red smashed potato that my in laws make with lots of fried dry red chillies. As a layman the thumb rule for me is, the shorter the chilies, higher the heat. That way I always keep away from the small round chillies that are found in Kolkata markets. Even for this green chili pickle I chose the longer variety of green chilies which has a beautiful aroma but less heat. For obvious reason my family never ever believed that I like chili pickle unless one winter morning I made hot fluffy alu parathas, Delhi style and had them only with this chili pickle. After my years in Delhi am a true believer that stuffed parathas are best eaten with hot and spicy pickles especially chili pickle. Though I often make stuffed parathas at home during winters still I miss those small eateries around the colleges where they served out of the pan hot, greasy, enormous alu parathas. As much as I try am yet to infuse that smoky flavour in my parathas. 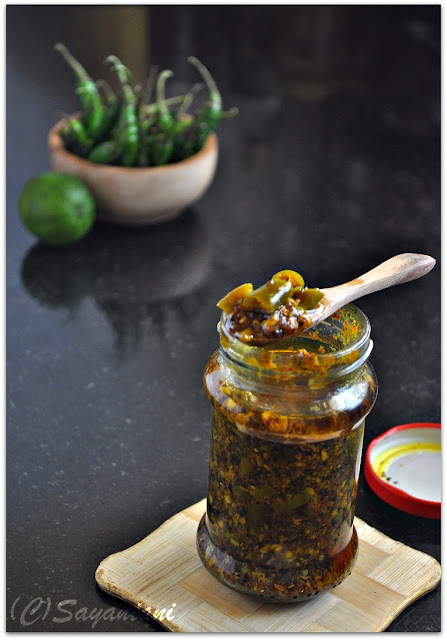 But what I can make easily is this green chili pickle, which is almost instant. This is my own recipe and I prefer to make it in small quantity for that crunch. Yes am hooked for life. Methi ke chawal or split fenugreek seeds: ½ tbsp* see notes; added a picture of split mustard and fenugreek seeds below. Wash and spread the chillies on a newspaper to dry. Once they are dry cut them in small ½” pieces. Place in a non-reactive bowl. Pour in the vinegar and the salt. Mix and keep aside for 1 hour. Dry roast the methi seeds and mustard seeds till they are a couple of shades darker. Cool and grind to a coarse powder. Peel the lemon (yes peel. Trust me it’s not that difficult for only one lemon). Cut them in segments, discard the seeds and mix in to the chopped chillies. After 1 hour mix in the ground masala, turmeric powder, methi and sarshon ke chawal and give it a good stir to mix everything together. Keep aside. Heat the mustard oil till smoking. Take off from heat and pour on the chillies. Mix well and keep aside uncovered to cool. Once cold pour in a sterilized glass jar. Place it in a hot sunny place for a couple of days before enjoying the pickle. You can have it instantly as well but this resting time matures the flavour. Methi and sarson ke chawal are the skinned and split seeds. I bought mine from M.K.Ahmed supermarket in Bangalore. Most probably they all store the thing but may be under different name. To make your own split fenugreek and mustard seeds, roast the seeds on very low flame for a minute or so just to make it warm. Take them out in a mortar and using the pestle press the seeds couple of times. The skin of the seeds will break and you will get split seeds. this adds a beautiful aroma to the pickle. Like all pickles make sure all the utensils you are using is dry. Sterilize the glass jar by boiling it in a hot water for a few minutes. This will increase the shelf life of the pickle. After the resting period check the salt. if needed add more. 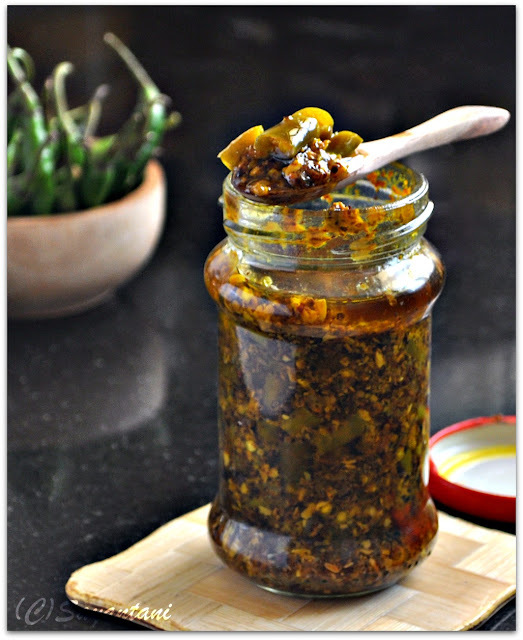 What a awesome pickle...Delicious dear..
Oh wow..this is one super hot and lip smacking pickle...I will make this soon..I am too fond of chilly pickles and this recipe looks like a keeper. I love green chilly pickles too, add a lot of green chillies to my lemon pickle and make a oil free version which tastes like kasundi. You reminded me to make that ASAP. yum..yum..lip smacking pickle!! 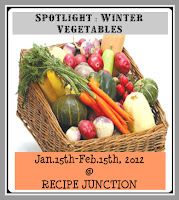 I would love to see your recipes for my 'Valentine's Day Event'. Mouth Watering. I would give a lot for some of that pickle. wow that looks amazingly appetizing! YUM YUM! Very tangy and tasty pickle. Pics are simply stunning. Darun chatpata achaar dekhei khete ichha korchhe. Stunning pics..
oooh,I can feel the flavor here Sayantani..Awesome preparation.Nice presentation too. 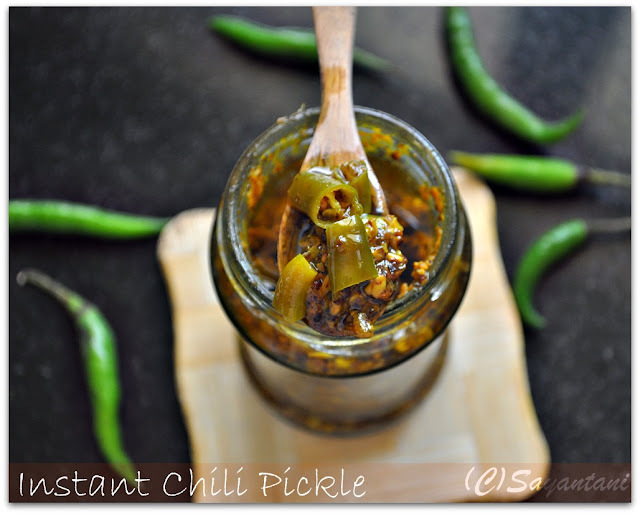 awesome one.. bookmarked.. my hubby would love it..
Wow,tasty tangy fiery pickle. Click is very tempting and making me grab some. Hot and fiery pickle tempts me a lot,mouthwatering here..
Gorgeous pictures! So rustic and well shot. They will fit into any high-end magazine. It's so tempting . Nothing can taste better than a hot chili. Delicious pickle and very tempting clicks...mouthwatering here. thanks for dropping by...nice pickle recipe...have all the ingredients in home.. will sure going to give it a shot. This pickle looks so good! Love the pictures too. tomar hot and spicy pickle is just delicious and mouthwatering! 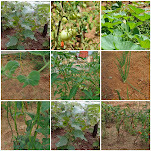 Hi Sayantani I've missed quite a bit of action on your blog and will catch up slowly as am resting at home for a month. wanted to add...Thank you for inquiring about my health and I love to keep in touch with you, always. I am drooling over the pictures. tonguetickling recipe..thanks for sharing dear. This is mouthwatering!! And to think of the alu parathas that go with it. YUM!! I was looking at the pictures and was wondering where i had last seen it, and reading through i remembered. It was served with aloo parathas (either in delhi or kolkata, can't remember that right). I loved it then and these pictures make my mouth water now. Ouusssssshhh!! That looks spicy good.I am a big lover for spicy pickles. I eat them really rarely and this one forces me to recreate it in my kitchen. I have bookmarked it. Few months back I had made red chili aachar which is almost getting over. Next attempt would definitely be this one! @Cham and Arch, methi and sarson ke chwal are split seeds which are mainly used for pickling purpose. just have added a click in the post. in the packet it is written as methi dal and methi ke chawal. 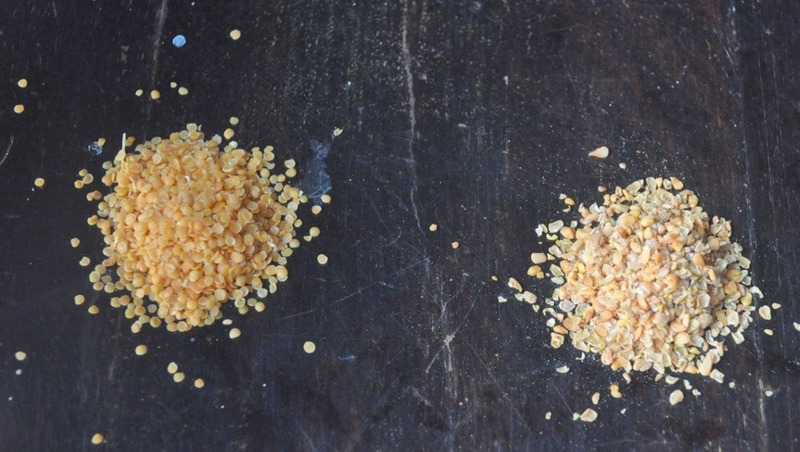 just got to know from another blog that split mustard is also known as kaduku parippu in Kerala. Have never come across split methi and mustard! The pickle looks delicious - must be great with parathas! What great shots! Lovely recipe, too. 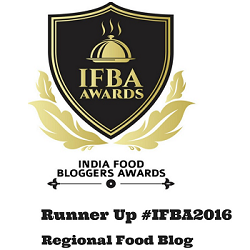 First time here..loved your blog..happy to follow it..Chili pickle looks so yummy.. I'll make this pickle this weekend...looks tempting. Thankfully, Indian stores in New York stock all these spices and I have them handy. I am hooked to these pics... not being a very big fan of chillies, I am desperate to try this one..
please do visit my blog as well for your kind participation in the ongoing events. Hii.. Thanks for you posting this blog. I bookmarked this blog. I will try it this in home. 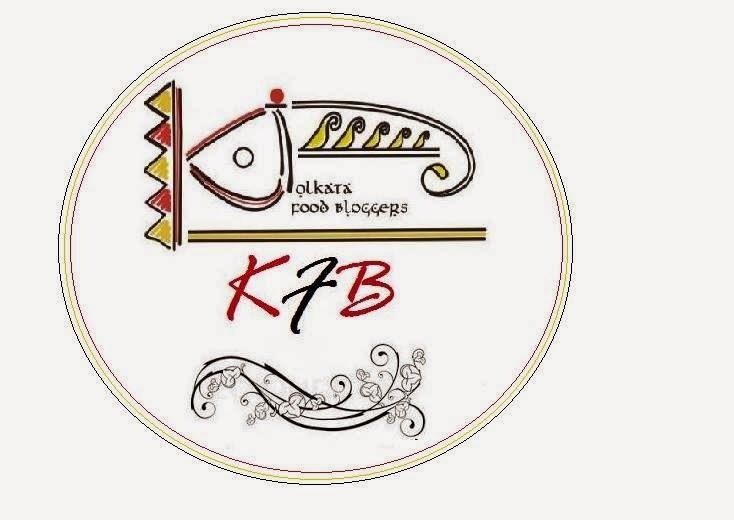 Love your recipes..thanks for them. I love this recipe, thanks for sharing! Can I ask you with meal is good for alon with?